Fuji TV broadcast the original Getter Robo (ゲッターロボ) anime from April 4, 1974 to May 8, 1975. The show featured three vehicles which could combine to form three different robots, called Getter 1, Getter 2 and Getter 3. 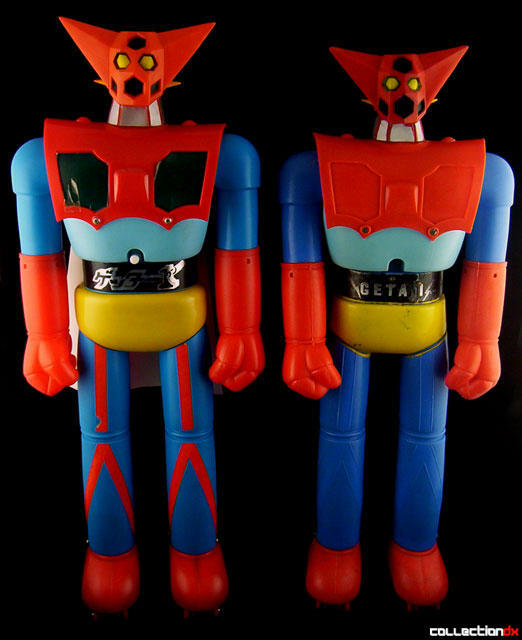 The show was very popular and all three robots were released as Jumbo Machinders in 1974. Of the three, Getter 1 is probably the easiet to get, followed by Getter 2. Getter 3 is indisputably the rarest and most sought after. These three Jumbos were the first hero characters in the line to not be numbered on the box. Why Popy chose to assign numbers to just the first 5 toys in the series is unknown. The character of Getter 1 is one of the most popular of Japanese Super Robots and the Jumbo Machinder is a perfect example of what most Jumbo collectors like about the line...a simple design, bright primary colors and just enough gimmicks to make it interesting. And, of course, size. 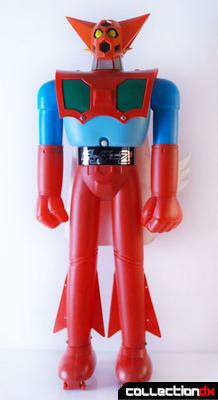 Getter 1 is the standard 23.5" tall, with a soft vinyl head and polyethylene body. It has two pairs of wheels on each feet and the hands, which can be removed and swapped with separately sold accessory fists, feature some nice white spikes on the forearms. 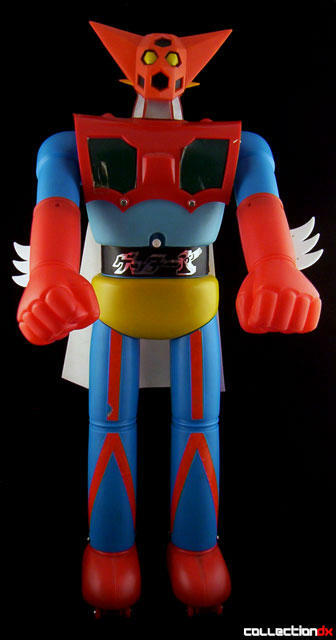 This toy also has something that no other Popy Jumbo had....a cape! White on the interior and shiny red on the exterior , it really gives the toy an added dimension. The soft vinyl head has painted details and is actually more orange than the red on the rest of the toy, but it can be hard to see in pictures. The rest of the toy features stickers for details, green on the chest and red on the legs. Note that the green on the chest has a thin line of black along the outside edges. This is an easy thing to overlook, but should be noted for those that might need to do some repro work, as these stickers are often damaged or missing. The waist sticker is black with "Getter 1" written in Japanese, in shiny silver. It may not be very noticeable, but "1" is written both numerically and also phonetically in Japanese (ワン). Copyright information is stamped into the back of the toy, just above the top of the cape. Probably the most noteworthy feature of the toy is that it can be separated into two parts by pressing a tab on the front and back of the waist. Each of the three Getter Robo Jumbo Machinders have this feature and you can mix and match the parts to create different forms! Sadly, I do not own either Getter 2 or Getter 3, so I will let the box art show you what I mean. The other side of the box is less interesting and simply shows you which Jumbo accessory fists were available in stores at the time. 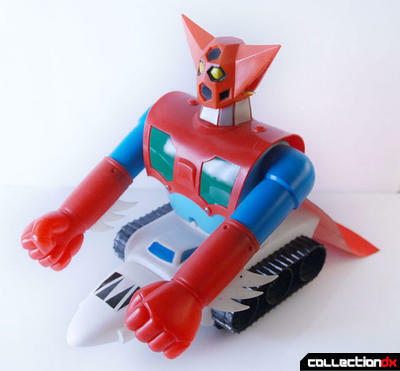 Although Getter 1 is an easier acquisiation than the other Getter Jumbos, it can still be on the expensive side since it is a popular character. There is another bootleg version from Mexican toy makers Jugarama. They released a slightly different version of this toy, that can occasionally be found cheaper. Here is the opening of the show. Note how the color scheme differs. For this reason, many collectors have made custom Getter 1 Jumbos to more accurately match the anime. Additional images! Please see the reviews for Getter 2 and Getter 3 for more!